This is not just a pictorial view. 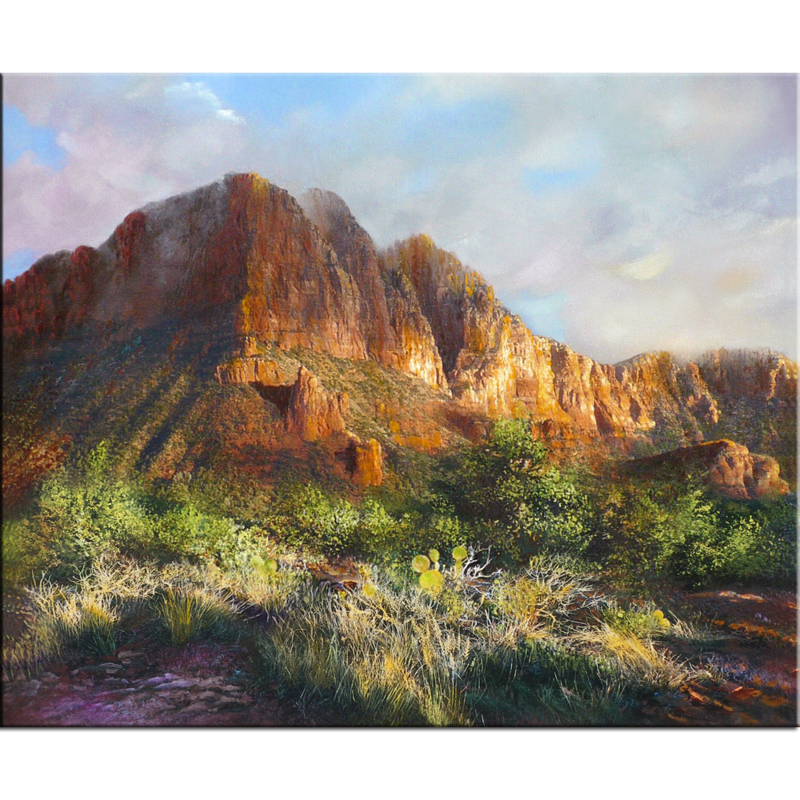 It is the view outside the artist’s studio window in Sedona, where she has lived for years, carefully observing every shrub and meeting many of the rabbits living under them. Herds of javalina seek shelter here in the winter snows, and deer graze peacefully in the summer when cactus offers its rich fruit. Red-tailed hawks circle overhead and even an occasional bald eagle flies in for winter seasoning. Though it seems a desert, it is teeming with life. Of the many seasons of beauty on these hills, the one chosen to commemorate most aptly describes high desert life–the summer monsoons. This is a time in July and August, when the heat of summer is canceled by sudden rains that usually come in the middle of the day. They drench the ground for about an hour and then move off, leaving the most wonderful refreshing aromas of sage, pine, and cedar, with clouds that form patchwork patterns across the sky, setting the stage for spectacular sunsets. The desert is a paradox, and this season most perfectly captures that quality when life is renewed at the height of its challenge to survive.